With a buzz of excitement the expedition team for Exercise Dhaulagiri Serpent arrived at 201 Field Hospital on Sunday 24th April; eager for the start of the high altitude medical research expedition. The expedition focus was on high altitude and its effects on the human body. 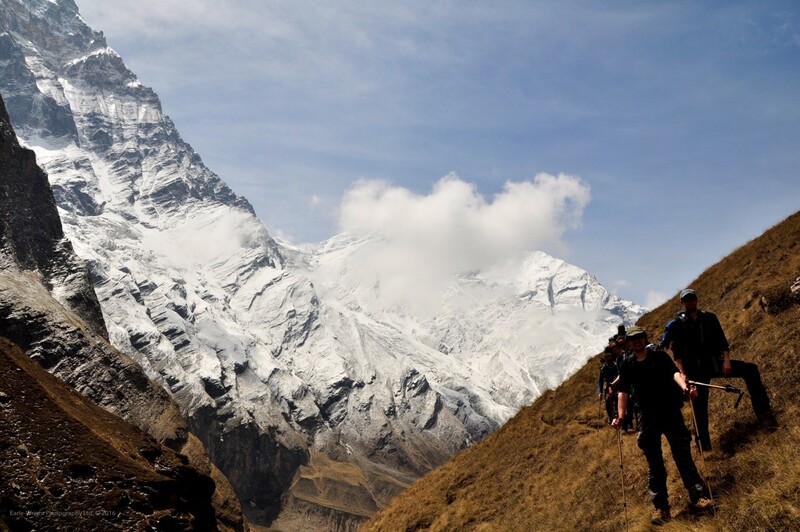 As such, the trek not only comprised some arduous trekking over 2 weeks, but also stops at various research camps along the way to provide blood samples and spleen measurements. These results would be collated with those from 9 other trekking teams to provide data for various research papers. This was no ordinary trek; it had huge implications to develop our understanding of altitude sickness and its management. We were met on arrival at Kathmandu airport by the far frontiers team, with the ubiquitously friendly Nepalese welcome “Namaste”; a word which would become second nature to us by the end of the expedition. Cultural visits ensued in earnest the next day, with a visit to the British embassy, followed by trips to Kathmandu’s major temples to help us better understand the important role religion plays in Nepal. Whilst travelling around the capital, we witnessed first hand evidence of the devastation caused by the 2015 earthquake, which was very sobering. After a final day of kit checks and last minute preparation, we were ready for the onward journey to Beni, the overnight stay there and then the expedition proper would begin. Another early start (this became a theme!) and a 3 hour bus journey took us to the start of the trek. This is where we picked up our companions for the expedition, the sherpas and porters who would be our guides, friends and guardians over the course of the trip. Our bags were bundled up, three a piece, and loaded onto the heads of the strong men and women supporting us. Donkeys were packaged up with pots, pans, oats, chickens, and all sorts of paraphernalia to allow us to complete our aim. We were itching to get underway, the weather was warm, and we had been cooped up travelling by plane, bus and car for many days, so were ready to stretch our legs. The scenery was varied and beautiful, the terrain undulating to say the least, and by this point, all the planning, preparation and anxiety had been worth it. There was a waterfall and river awaiting our arrival at our first campsite. We washed our tired feet, bathed and refreshed our clothes, while the evening meal was being prepared. The local village put on a show for us that evening for entertainment; traditional song and dance, and then invited us to join them…. which we duly did, to limited success! The evening closed in, and so the team retired to their beds to reflect on what the days ahead would hold. We soon fell into a daily routine, leaving around 0830, walking for 3 hours in the morning, stopping for lunch in the heat of the day, before continuing on in the afternoon to our overnight camp. We passed through villages, fields, gullies, along ridges and rivers, through forests and over barren dusty mountains. 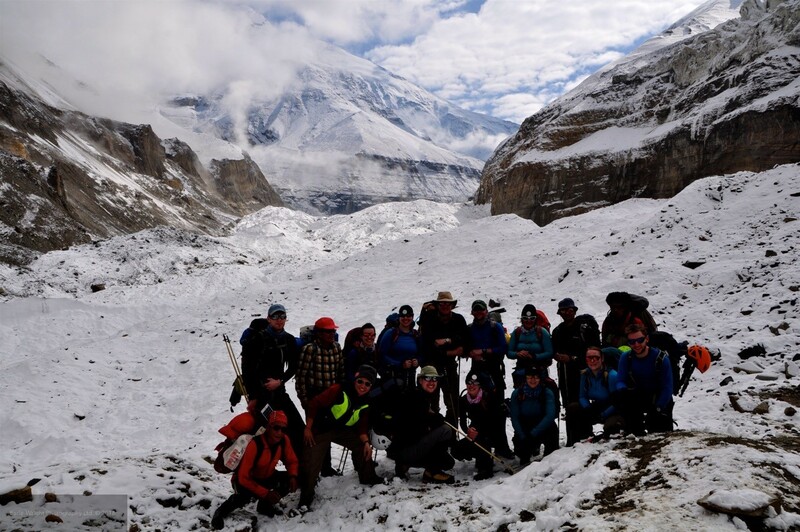 All types of terrain were covered, and our guides would provide local information and teach us Nepalese as we went. We also used the time we had to teach the juniors on the trip more about military tactics, and the senior doctors had time to test the junior doctors on their medical knowledge. From Beni to Barbhang to Dharbang, through Bagara to Doban and on to Sallagiri on day 5, we reached 3120m. As we climbed we started to notice the temperature dropping steadily, and soon bathing in the streams was no longer an option, and the night time temperatures dropped well below zero. 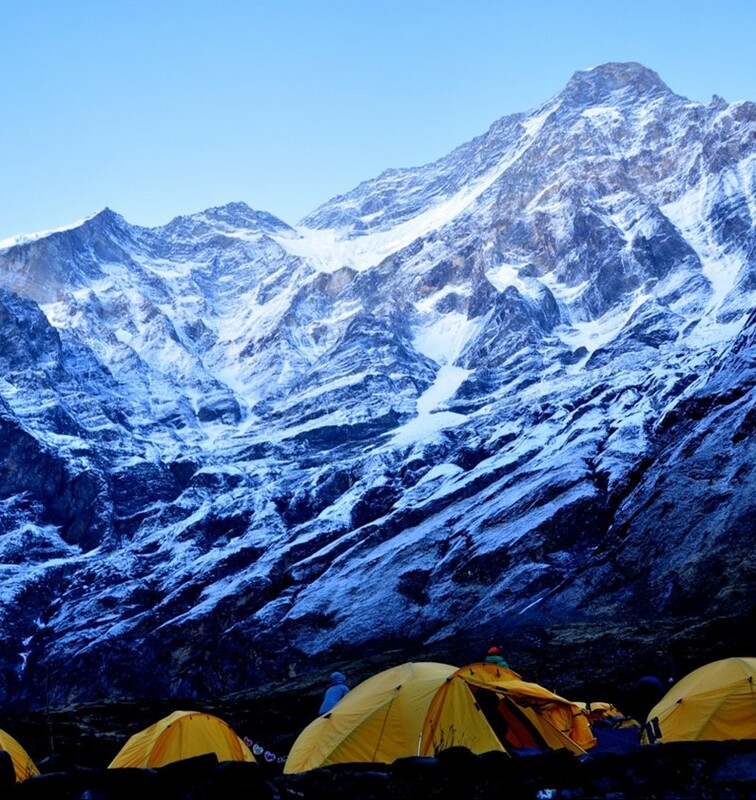 Soon we reached our first research camp at Italian base camp, sited at 3600m. We also had our first rest and acclimatisation day here. Bloods were taken, spleen measurements recorded, and a further acclimatisation walk conducted, followed by the slowest and shortest game of rounders ever played! Even the sherpas and porters were incredibly out of breath at this altitude ensuring the scores of the match remained low, and then the rain settled in for the evening sadly stopping play! Onwards and upwards took on a whole new meaning, as the temperatures dropped, the altitude increased, the pace slowed dramatically, with the terrain undulating to match morale. Most of the group had suffered stomach upsets at this point, so it was imperative to keep well hydrated. Word reached us that some climbers from trekking teams ahead of us had fallen seriosuly ill with altitude sickness and required evacuation by helicopter from the mountain. Unnerved slightly in this knowledge we all mentally readied ourselves for what lay ahead – we were all determined to complete the trek together and not leave anyone behind. We reached our next overnight stop, Japanese Base Camp, in a flurry of snow with a series of thunderous nearby avalanches punctuating our sleep. We continued the next day towards Dhaulagiri Lower Base Camp, with the promise of another rest day and the penultimate round of medical research. At this point we met the High Altitude Development Team, who were attempting to summit Mount Dhaulagiri without Oxygen, quite an undertaking considering Dhaulagiri stands as the worlds 7th highest mountain. The scenery was stunning, and the next day we woke to brilliant sunshine, snow topped mountains poking out behind imposing clouds. The walk onto the final high altitude camp was by far the most testing day, steps were slow, heavy and deliberate, stops aplenty, nausea and headaches accompanied most. It was with due elation we arrived at our final research camp, Hidden Valley, standing at an impressive 5100m. With the weather closing in, we began our descent down the mountain. Morale was high, with hail and white out conditions doing nothing to deter us from the 2000m of descent we needed to achieve that day. 12 days to ascend, and 2 days to descend! We reached our finishing point of Jomsom at noon on Wed 11th May, with a huge sense of satisfaction, having been one of the only trek teams at the finish with the whole team! A testament to the strength of leadership and teamwork in our close knit team; showing that the hard work, training and sheer grit and determination of the reservist unit had paid off, embodying what the Army Reserve and adventurous training are all about.